Hello Friends! This year I chose the word "Simplify" as my One Little Word. I'm sure many you also struggle with keeping things simple. I also moved into a new classroom this year, and I've had a difficult time finding logical places to store things. 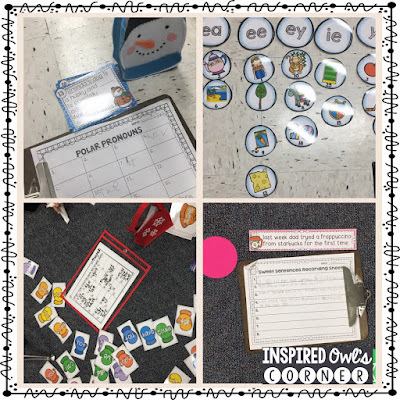 Today I am sharing an idea I've seen and am planning to try for organizing my thematic and seasonal teaching materials. This year we have been encouraged to do much more thematic teaching at my school. I have lots of centers, art examples, and teaching materials for my thematic units that I needed to find a way to store easily and quickly grab. I had some things in my file cabinet and others were shoved in my closet. My centers/workstations were in my file folder and magazine holder filing system. 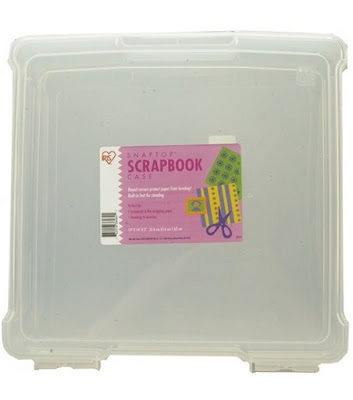 Since we have been doing our thematic teaching by month, I decided to buy the cases below from Joann's to store my thematic centers and extra copies of thematic units. They are large and deep enough to store my monthly resources. My plan is to make some monthly labels to I can quickly grab the box I need. Once the month is over, I can put everything in the box and easily store it in my closet. No more hunting in three different places for the materials I need! At least that is what I'm hoping! I will be back to share labels and let you know how it's going. I've also decided to use Zip Lock 1-Gallon Storage bags to store my centers/work stations. They are easy for the students to quickly grab and get to work. The cover and directions for each activity are in the front, and there is an answer key for the group leader in the back. 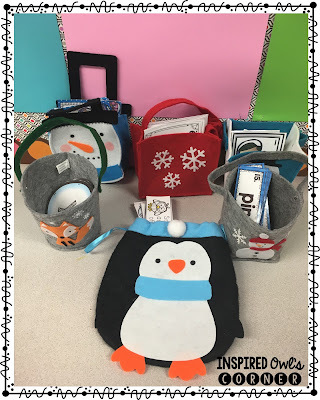 The cards could be kept inside, but I put them inside the seasonal felt bags I've been hoarding from Target's Dollar Spot. (See below). This worked perfectly last week! 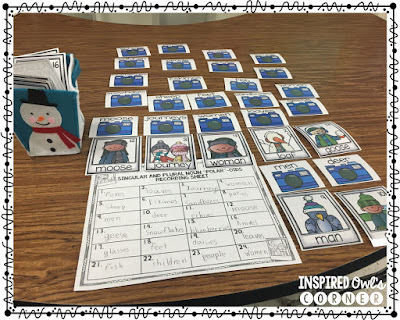 Groups were set free to work independently on their Winter Wonderland Activities, and I was able to pull my ELD group to the back table for some uninterrupted reteach time since the rest of the class was engaged and on task! 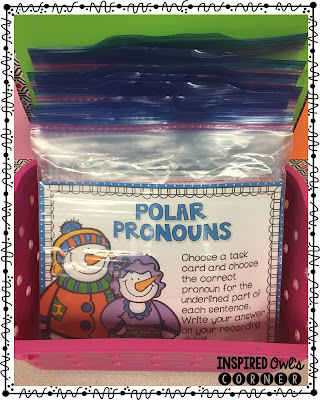 If you want to try a freebie sample of Singular and Plural Noun "Polar"oids, from my Learning in a Winter Wonderland pack, you can click on the picture below to grab it. 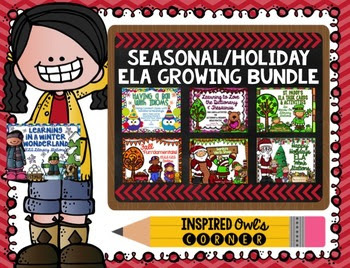 I'm also giving away my Seasonal/Holiday ELA Literacy Stations Growing Bundle. Right now it has 7 files in it, including the one above, and I plan to add a Spring/Easter set sometime in March. Leave your email below, comment on a skill I should add to that spring pack, and I will choose a winner on Monday! How about balancing equations (like 1+4=2+__). Oops, that last one was me. Apparently I think balancing equations is part of ELA. How about ABC order to the third letter. Synonyms and antonyms would be great. Your products look awesome. Thanks for your hard work.